Soviets Recovered an Apollo Capsule! In 2002 this web site broke the story that the Soviet Union had recovered an Apollo capsule in 1969 and returned it to the Americans a year later in the extraordinary Cold War visit to Murmansk by the American Coast Guard icebreaker Southwind. Recently Michael Stronski, a Southwind crew member, has provided additional extraordinary photographs of the event. Michael Stronski's photo of the captured Apollo capsule. The icebreaker Southwind was commissioned as a US Navy vessel on 15 July 1944 but was transferred to the Soviet Union on 25 March 1945 and named Kapitan Belousov. It was returned to the US Navy five years later and renamed Atka. 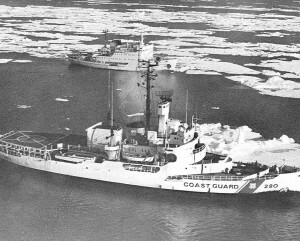 After years of Arctic and Antarctic service it was handed over to the US Coast Guard on 31 October 1966 and reverted to its original name of Southwind. After a refitting its first cruise was to the Antarctic, where it ripped its bottom out in Palmer Bay and limped back to the United States at 10 knots. In early 1970, UK-based naval units were training in recovery of an Apollo boilerplate capsule (BP-1227) as part of their assigned mission of rescuing Apollo spacecraft in the case of an emergency abort or return to earth. The capsule disappeared at sea. The circumstances of the loss of the capsule are still not clear. It is not known whether a Soviet 'fishing vessel' nearby was in fact a spy trawler and if the capsule was taken as part of an intelligence operation. This photograph shows the capsule in 2002, when it was serving as a time capsule not to be opened until 2076, at Grand Rapids, Michigan, USA. In June - November 1970 the Southwind was sent on an extended Arctic cruise, conducting oceanographic surveys in the Barents and Kara Seas and resupplying US polar bases. 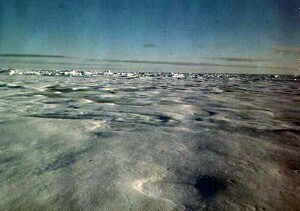 Following a visit to Greenland, the Southwind reached 83 deg 01 min N on 15 August 1970. Only 419 miles from the pole, this was the northernmost point reached by a US icebreaker to that date. 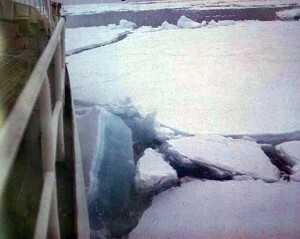 The breaker was finally stopped by solid ice at least 10 to 15 feet thick. Due to global warming, by 2007 the ice thickness was half that at this latitude and a waterway one mile wide opened up. This was the first time in millions of years that this had happened. Michael Stronski notes: "I take it our crew were one of the very last to see the pole as it has been for millions of years". A buoy was marked to commemorate the event�.and dropped into the Arctic Ocean. Since it was payday, they were told this made them the 'highest paid crew in the Coast Guard'. In the far Arctic the Southwind became locked in the ice. 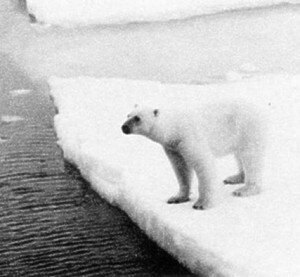 This polar bear, named Rodney by the crew, ambled up to the icebreaker. They fed him pizza, Cornish game hens, and finally lasagna. 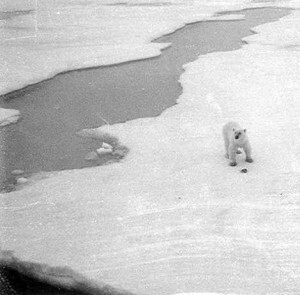 Throughout the cruise, every time they passed by any of then-numerous polar bears they would feed them something from the ship's mess. But Rodney was the only one to hang around for an extended time. After getting clear of the ice and heading south, the crew was surprised to find itself being trailed by a Soviet icebreaker, which they dubbed 'Vladimir'. The ship followed them everywhere, but always keeping a proper distance, and hoisting proper signals when the Southwind came to a stop. Southwind then stopped in Iceland and went on to make a visit to Murmansk. 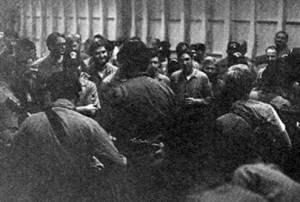 This so-called "courtesy call" was the first visit to the Soviet port of a US military vessel since World War II. 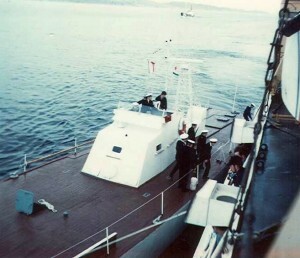 This photograph shows Deputy Commander of the Soviet Northern Fleet, Rear Admiral Garkusha and his staff boarding the Southwind from the pilot boat at the entrance to Murmansk sound. Stronski remembers, "All cameras were suppose to be below deck and all port holes closed. Like a nut I got this picture off from the hanger bay. Was called to the captains office on this one�"
The Southwind was opened to the public, and over 700 Soviet citizens toured the vessel over the next few days, including Soviet staff officers. 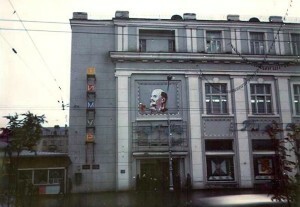 And visiting the tourist sites of Murmansk, such as the shops and theaters.. 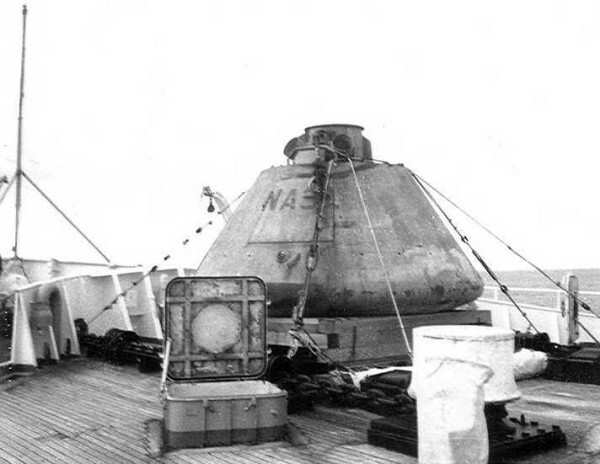 While in Murmansk the crew was surprised to be presented with an American Apollo capsule, which the Soviets said had been recovered by one of their fishing vessels in the Bay of Biscay. It was BP-1227 - the capsule that had gone missing a year earlier. The handover was made with considerable ceremony and covered by Hungarian press representatives. 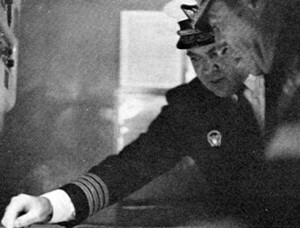 The capsule was loaded onto the ship at the forward gun mount. Lashed to the deck, it accompanied the Southwind after its departure from Murmansk and later tour of the Kara Sea. 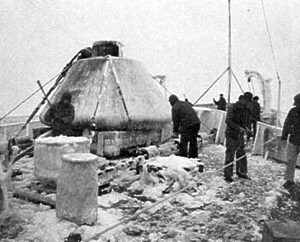 This photograph shows the capsule in icy conditions on that part of the voyage. While in the Kara Sea, there was an incident where the ship was bumped in the early morning hours by 'Vladimir', the Soviet icebreaker that still shadowed them. Stronski remembers, "I was on the bow at that moment and general quarters was sounded. The next day our choppers flew over their ship and drop some bags of garbage on their bridge � pay back time.. " The crew ignored the provocation and continued on their planned cruise. Following visits to Tromso and Oslo, Norway and Copenhagen, Denmark, the Southwind docked at Portsmouth, England, where the capsule may have been unloaded and turned over to the Royal Navy. It then proceeded to Nova Scotia before finally returning to its home port in Maryland. Following the completion of the Apollo program, BP-1227 was returned to NASA and then handed over to the National Air and Space Museum. It was finally loaned for one hundred years to the city of Grand Rapids, Michigan, to serve as a US bicentennial time capsule. It is currently on display in Grand Rapids, and not to be opened until 2076. The circumstances of the loss of the capsule are still not clear. It is not known whether the Soviet 'fishing vessel' was in fact a spy trawler and if the capsule was taken as part of an intelligence operation. If so, little of value could be obtained from the boilerplate. While the parachute compartments and recovery aids at the top of the boilerplate were probably representative of flight hardware, the rest of the capsule was built of sheet metal with a fiberglass representation of the heat shield. However US intelligence agencies had made Herculean attempts to make detailed examination of similar mock-ups or stripped versions of Soviet spacecraft so this possibility cannot be dismissed. I found in my space collection an interesting photo. 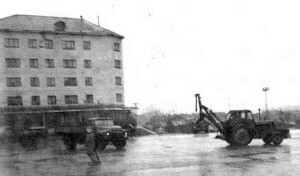 The Hungarian caption reads: "Murmansk (Soviet harbor). An Apollo capsule is turned over to a US delegate. Soviet fishermen recovered it in the Bay of Biscay. Photo: Hungarian News Agency. Date: September 8, 1970." John Charles confirmed: "...First, it is a Block 2 (looking at the shape of the forward RCS) CM boilerplate. 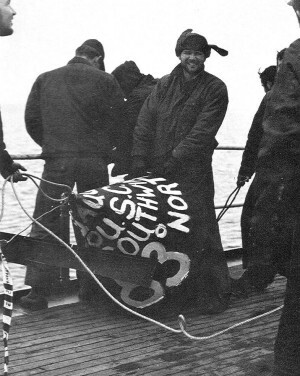 Second, the lettering on the capsule appears to spell NASA in the "standard" font that I have seen on other recovered BPs....The sailors are obviously US Navy, the civilians look like Europeans...."
Eugene L Griessel identified the vessel in the background as a "Wind" class US Coast Guard icebreaker. 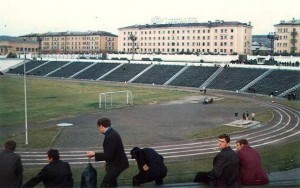 In the background there are huge, ugly, long buildings, definitely Soviet architecture. It is not quite visible in the scan. The text says: "Raising of an empty Apollo trial-capsule from sea". This looks like garbage to me, I wonder if the cabin is actually being LOADED onto the ship! I assume both pictures depict the same place, the same time, same scene. Now this picture quite clearly showed Murmansk in the background and the foredeck of a "Wind" class Coast Guard Icebreaker in the foreground (with the forward gun mount removed, onto which the capsule is being lowered). As for which specific vessel it could be, a check at Ken Laesser's Coast Guard History site showed that the vessel was the Southwind, which was listed as operating in resupply of Arctic bases in June-November 1970, reaching a record 83 deg N latitude on 15 August. Home based in Baltimore, Maryland, the Southwind matched the vessel in the photos both in having the forward gun mount deleted and in the configuration of the aerials and radar. 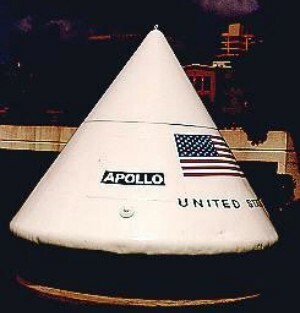 ...there were a series of Apollo BP's used for similar training. JSC-03600 reports that BP-1204 was with Carrier Task Force 140 at Rota, Spain; BP-1215 was with CTF 130 at Yokoska, Japan; BP-1223 in the Azores. There's no indication of one assigned to the RN but many of the series BP-1201 to BP-1233 don't have any explicit assigned role but were probably used in this kind of operation. This Apollo Command Module (No. SN BP-1227) contains memorabilia, collected by area high school students. This memorabilia reflects life in Grand Rapids, Michigan, at the time of the City's Sesquicentennial and the Nation's Bicentennial. It was used in training for the recovery of astronauts returning from the moon. During an exercise off the coast of England, it was lost at sea, found by the USSR, and returned. The module is on loan from the National Air and Space Museum to the people of Grand Rapids and is to be opened July 4, 2076 during our country's Tricentennial. Crew member Mike Malone reported: I do remember picking the capsule up in Murmansk. We brought it back to the US but I don't remember where we off-loaded it. 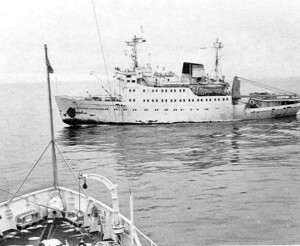 It was the USCGC Southwind that was involved and the visit to Murmansk was in between segments of oceanographic surveys in the Barents and Kara seas during the late summer of 1970. As far as I knew the pickup of the capsule was just incidental to a visit that would have occurred anyway and was something of a surprise. We were told that we were the first military vessel into Murmansk since WWII but I don't know if that is confirmed. The visit was kind of a big deal with ceremonies and what not. I'm attaching another picture from the cruise book. Crew member Nevin Fahnestock remembered: I spent from 3-70 to 12-71....Made two north trips to Greenland, Iceland, Murmansk, Tromso, Portsmouth, Oslo, and Copenhagen. Had Russian icebreaker drift into us in the middle of the night. Have some wonderful memories!! I was on Southwind from 69-71 as SA/SNBM. Remember BMCM Hamlin, BM1 Williams, Graham Jones, Mike Pendleton, Bobby Padgett, GMI Ray Burr and many more. 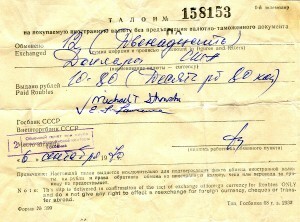 This is the period of time we made the port call to Murmansk and picked up an American space capsule. We also were gently nudged by a Russian ice breaker in the early morning hours one Saturday. This trip also provided us with the opportunity to make the most northern surface penetration of any US icebreaker (at that time ) 83 -01 North. The memories keep coming. I retired from Sta Little Creek, Va in 1990 as a BMCM. I played in a band on board the Southwind and we had the privilege of playing in Murmansk during a reception held in our honor. We were doing well until I sang the Beatles song "Back in the USSR." The band was promptly escorted off the stage and not allowed to continue�.I think that I am the first person to have actually had the privilege of singing the song in Russia�This was the one and only visit to a Soviet military port during the cold war to my knowledge. The only thing I can recall is that we were not informed of picking up the Apollo capsule until we were a few days out of Murmansk. I was there and have pictures of Southwind from the city's high point, a Russian convoy on the streets, the capsule on the ship, pictures of Lenin on store walls, the Russian icebreaker that always followed us, even the Russian pilot that came aboard our ship when we were told that all port holes had to be closed (took heat for that picture, that was a no-no at that time). I was standing at the point of impact when that Russian ship drifted into us. He hit us on the starboard side about 10 feet from the bow and general quarters were sounded�I served on the ship from 1969 to 1972. Other crew members that remembered the trip to Murmansk were Bobby Padgett , Jeff Williams, and Joe Farrell. The Southwind's visit to Murmansk seems to have been arranged as part of the Nixon/Kissinger/Brezhnev detente policy of the period. The handover of the capsule can be seen in this context as a typically Russian surprise 'goodwill' gesture. Are some details known of the arrangements for this visit? The space capsule was a surprise to the crew. But did the commanding officer know that a capsule would be handed over? Have accounts of the recovery and examination of an Apollo capsule been found in any Soviet spy memoirs? These Block II Apollo boilerplates seem to have a very obscure history. Is anything more known of the rest of them? Are there more details of the history of BP-1227 before and after its recovery and handover? Was the boilerplate returned to service at Portsmouth or returned to NASA in Baltimore? the forward gun had been removed - ahead of time? Flashback attack: Must Every Band Reunite?